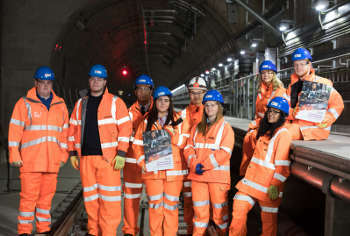 In Partnership for Britain’s Prosperity is backed by train companies, Network Rail and industry suppliers, and is described as ‘one railway working in partnership’. It also includes research that claims investment of over £50bn between 2014 and 2020 will deliver £82-£84m of economic benefits over the life of the new assets, in addition to an existing figure of £31bn of annual economic benefits at present. Paul Plummer, chief executive of the Rail Delivery Group (RDG), which represents train operators and Network Rail, described the plan as 'a landmark coming together' that would ‘play its part in ensuring that Britain continues to be an attractive place for skilled workers, innovators and investors as we leave the European Union’. He said: 'During the next 18 months, customers and communities across the country will begin to see unprecedented improvements in the railway with more trains, better services and improved stations. This promises to create more and better opportunities for our people while enabling improved productivity and economic growth throughout Britain. In recognition of high levels of public scepticism about train services, the RDG said that over the coming months, rail companies would be ‘launching local activity to demonstrate changes for customers, businesses, communities and their people locally, and continuing to engage with local stakeholders about the future of the railway in their area’. Mick Cash, general secretary of the RMT union, said the plan had been 'cobbled together' and was 'just the same old fantasy railway plans and promises of jam tomorrow that the public are sick and tired of'.